Two or more batches can be blended together on the Batch Blending tab. First, select where the blending will occur; either in the Cellar, Racking Bulk, or Bottling Bulk. (Review “How Beer Flows” if you need clarification on these different terms.) Then, select the source batches you want to combine and the amount to be blended. If you want to blend more than 2 batches click the “Add a batch” button to add the third (or fourth…) batch. To complete the blending select an existing batch as the Target or enter a new Batch number, and, finally, the target date of the blend. Click Save. The blend will show up in both your Entry Log and Batch History. Note that you cannot edit a Batch that has been blended, you can only delete it and recreate the Blend. Also, if you delete a Blending entry, all entries associated with the blend will also be deleted. Please see “Making corrections to Entries” for more information. Click on Batch Split/Combine in the main navigation bar. 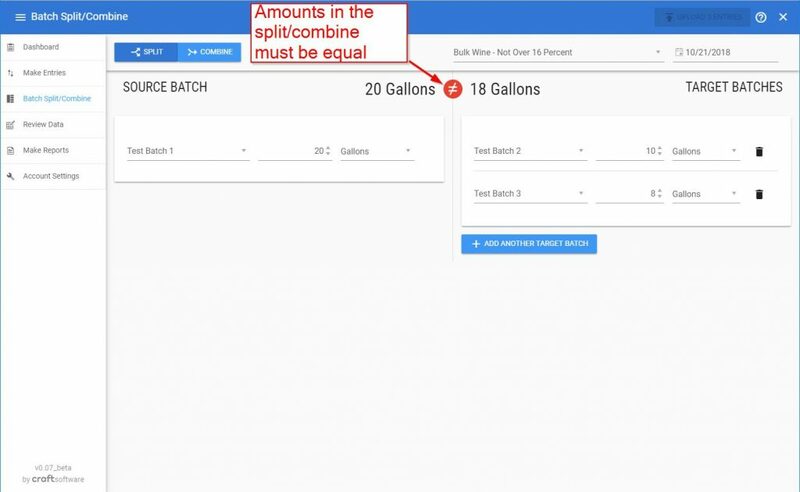 At the top of the page, choose whether you would like to split a batch into other batches or combine multiple batches together, then choose the category and target date. Next, fill out the appropriate fields on the screen with the batch names and amounts. Note that the app will expect the amounts to be equal before you will be able to upload your changes. 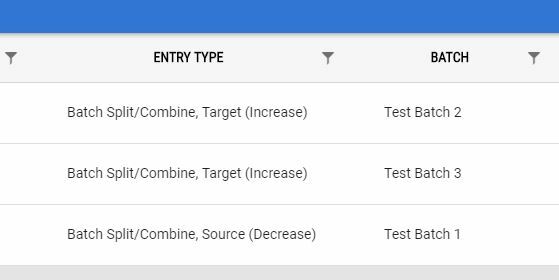 You can add additional batches to split into or combine from, if needed. Click upload and follow the onscreen prompts to verify your changes, and upload them. When you visit the entry log or batch accounting pages, you’ll notice that the entries are labeled batch split or combine. Note: Editing a split/combine entry in the entry log is not allowed. To make changes to a split/combine, first delete the split/combine and then remake it. Additionally, if one part of a split/combine is deleted then all parts of the split/combine will be deleted.